Martinique is an island in the eastern Caribbean sea. Christopher Columbus landed on the island in 1502 and called it the most beautiful place on the planet. These days, Martinique is an overseas region of France and known for its culinary culture, which is considered the most sophisticated in the Caribbean. And for a slice of it in Tokyo, you’ll find the restaurant Martinique near the shopping arcade of Musashi-Koyama. It’s a unique eatery with solid bistro fare. “So why Martinique?” you might ask. Well, the answer is simply that co-owner Chef Kazuhiro Miyakawa has long been fascinated by the island and its food and drink culture. After dropping out of high school, Miyakawa went to a mountain where he worked and snowboarded through winters. This was how he saved money to backpack around the world. In Morocco, Miyakawa hid his face with tribal robes, dancing and playing percussion with locals in front of European tourists, and even cooking tajine for travelers. In Mexico, he went to Isla Mujeres, a popular resort island in the Caribbean Sea off the coast from Cancun, on Mexican Independence Day. Here, in the festive atmosphere, Miyakawa saw a chef and his staff cooking as they drank and danced to music. It was in this way that as his childhood friends were graduating from college, Miyakawa decided to go to culinary school. Graduating eventually from the most prestigious culinary school in Tokoy, Miyakawa’s first job was at a renowned French restaurant, where the free-spirited young man only lasted six months. Back then, Miyakawa’s roommate was an aspiring comedian with no solid source of income, so Miyakawa was left juggling restaurant jobs and hotel work to support both himself and his roommate for four years until his roommate started making money! 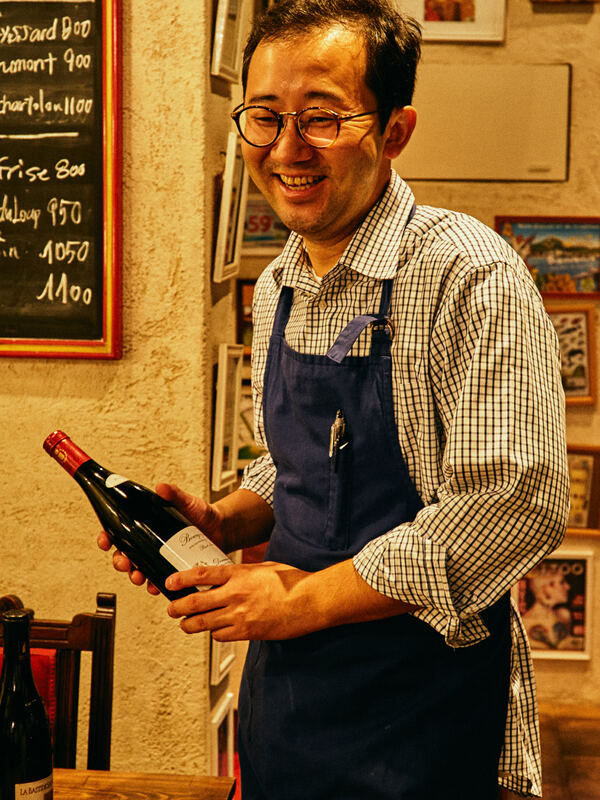 When he was finally able to focus on French cuisine, Miyakawa started work at Bistrot Quotidien, in Azabu-Juban, where he learned authentic bistro fare under the watchful eye of Chef Ryosuke Sudo. He started thinking about going to France to develop his skill, and one day was looking at a bottle of rum imported from France, only to realize that though it was aged and bottled in Bordeaux, it was originally distilled in Martinique. Intrigued, Miyakawa traveled to Martinique to learn about rum, and was surprised to see that French culinary culture had taken root all over the island. After his rum expedition, Miyakawa returned once more to Martinique, working for a restaurant and hotel, and learning not just French cuisine, but also a type of Caribbean cuisine called creole. 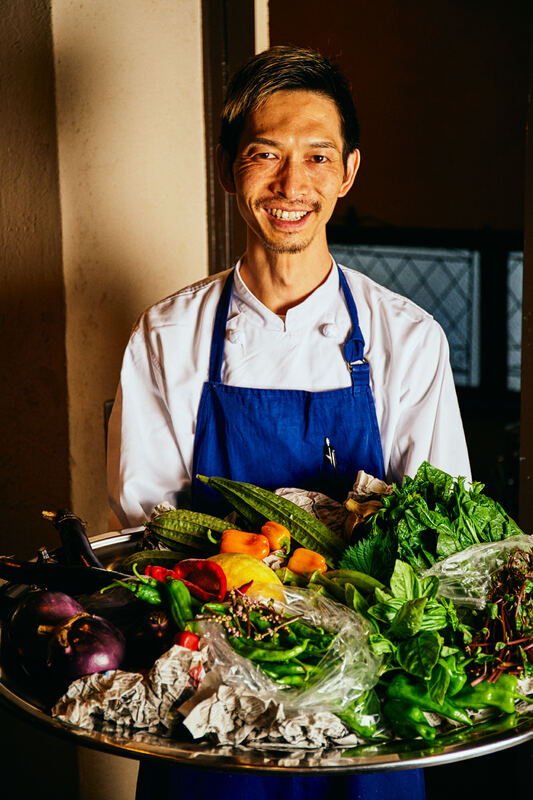 At his own bistro in Musashi-Koyama, Chef Miyakawa enjoys adding exotic spices to authentic bistro fare and sometimes using ingredients like green papayas to garnish his dishes. 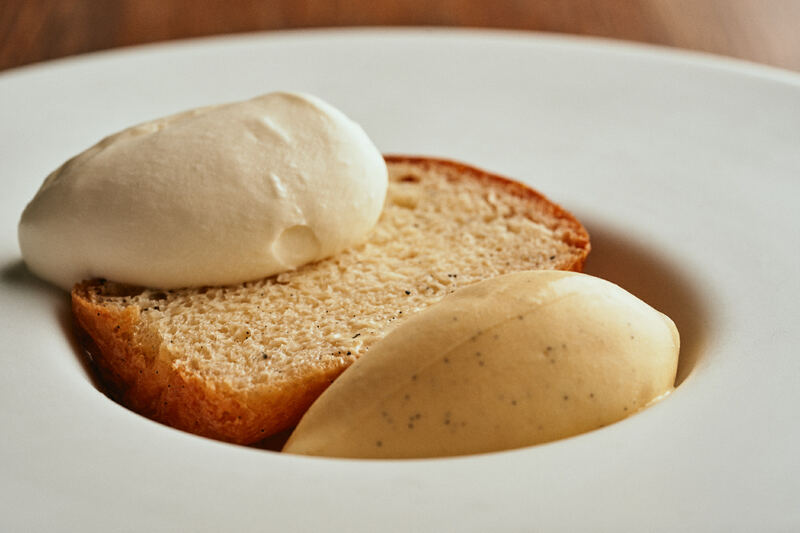 His most popular dessert, too, is powerfully spiked with rum from Martinique. Martinique attracts locals who are passionate about not only French food but also French culture in general. So if you are passionate about it too, Martinique is a place you’ll want to add to your list of restaurants to visit! This is a bistro where you can casually dine a la carte. Five small pre-appetizer dishes, ideal with a first glass of wine, are priced at 500 yen. Approximately 20 appetizers are available, priced from less than 1,000 yen. The most popular appetizer, mushroom salad, is 1,260 yen. Five main dishes are available, starting at less than 3,000 yen. The most popular is a quintessential beef dish of bavette steak (or flank steak in English,) which is 3,650 yen. Another popular main dish is the roast bone-in Iwachu pork, at 3,250 yen. Five or six desserts are available daily, starting at 630 yen. Every day Martinique prepares five flavors of ice cream. For parties of five or larger, we recommend the 5,000 yen set menu below. Martinique has a two course (appetizer and main) prix fixe lunch menu priced at 1,380 yen on weekdays, and 1,580 yen on weekends. While almost all of the 100 wines, red and white combined, are from France, you can also find wine from other European countries like Germany, Italy, and Spain, and New World wine from Australia, South America, and the US. White wines are priced from 3,000 yen and red wines from 3,500 yen. Eight Champagnes are priced from 7,500 yen. Four sparkling wines are available from 3,500 yen. 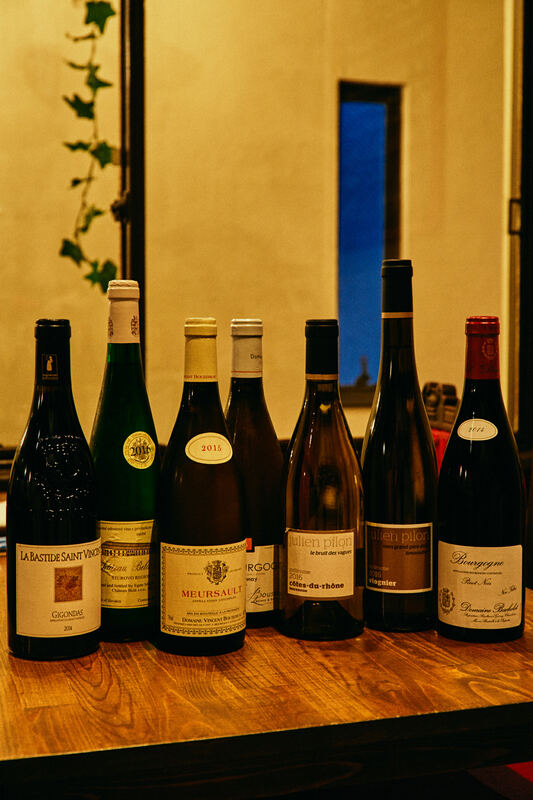 By the glass, four white and four red wines are available daily, priced respectively at 780 and 800 yen. Sparkling wine by the glass is 780 yen. This bistro also has good selections of Martinique rum. 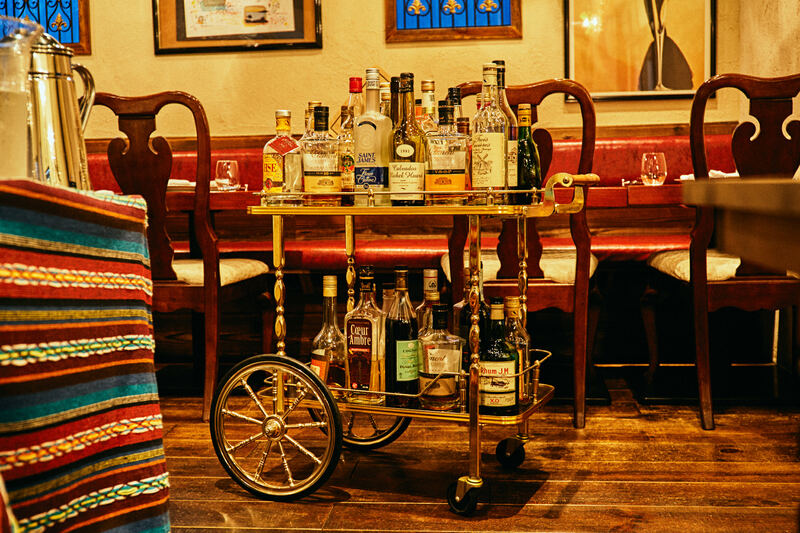 So we recommend wrapping up dinner with a glass of rum as digestif. Martinique’s wines are selected by Takeaki Sasaki, co-owner of Martinique and a certified senior sommelier. Sasaki was initially an aspiring cuisinier, and actually took some classes with Chef Miyakawa in culinary school. The first restaurant Sasaki worked at after school was known for its wine list, and consisted exclusively of Bordeaux and Burgundy wines. He began work as a service staff member, and enjoyed it thanks to the manager he worked under. Did not like Bordeaux wine…. Sasaki was just 19 years old when he tasted Bordeaux wines for the first time, at a wine tasting event. He still remembers not liking them and thinking they all tasted the same: very bitter. However, after trying the dessert wines from Sauternes, Sasaki was convinced that there were good, drinkable wines as well. 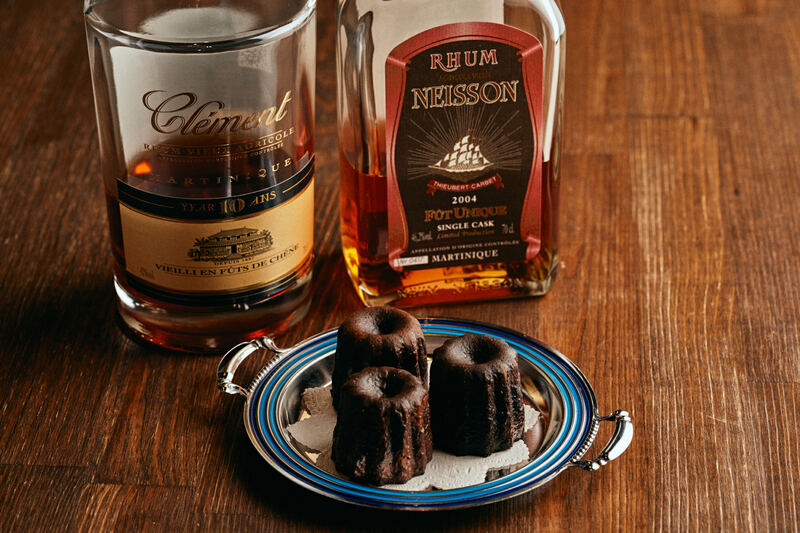 But it’s not just the wine; Sasaki also makes Martinique’s popular canelé, a small French pastry flavored with rum and vanilla, every day.